The combination of virtual environments and gesture control interface has increased in the past years. It is believed that these technologies could increase user engagement and the user experience. However, there is still no standard scale to measure user engagement in those systems. The User Engagement Scale UES, proposed by O’Brien is a multidimensional scale for engagement measurement. It had been tested in different conditions and systems, such as web pages and social networks, keeping consistency in its result. We apply the UES to a virtual reality game with gesture hand control, to evaluate its viability in this kind of system. A sample of 164 individuals, who attended a huge technology trend and information event, completed a questionnaire after playing the game. The game includes puzzle solving using hand gesture interface. The questionnaire was adapted from the original proposed by O’Brien, to fit the videogame application. 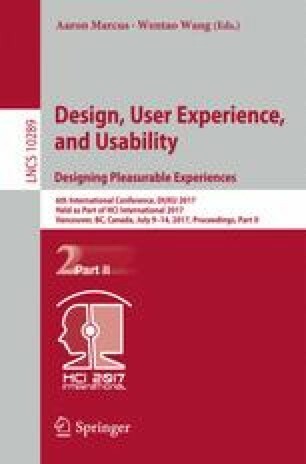 The UES scale is composed of six aspects or subscales: Perceived Usability (PU), Aesthetics (AE), Novelty (NO), Felt Involvement (FI), Focused Attention (FA), and Endurability (EN). The analysis results indicated that the scale had good reliability for all the aspects or sub-scales included. As a result of applying the principal component analysis, we found that the FA and AE components retained all its items. Meanwhile, the PU sub-scale is divided into three different components, and the NO, FI and EN subscales are combined in a new component. We establish a discussion of the characteristics and usability of virtual reality systems and gesture hand control that could cause these variations in the UES components. Also, we discuss the context as a potential key factor to influence engagement and user experience. The authors want to thank the developers of the Fixer virtual reality game, Arturo Jafet Rodríguez M.Sc., and Enrique Alberto Rosales M.Sc., from UP-Medialab, for providing access to the game. Also, we thank Allen Galaviz Gerardo for the help of database capturing.